Brook Thorpe of ONS MX INC and Revolve Racing are up at Southwick Pro Nationals with riders Joe Lafalce and Chase Couture! Good luck to Chase and Joe today. Live Video and Audio should start around 12:30pm ET. Joe LaFalce has been racing for many years, and with this being one of his first few attempts at an outdoor national, I was very excited to see him make the program at Southwick! Congratulations to Joe and his family! DZP: Joe, you made the program at Southwick, which I personally think is GREAT, so how do you feel about that? Joe: Yeah it feels really good to have something you’ve worked really hard at for a long time happen. 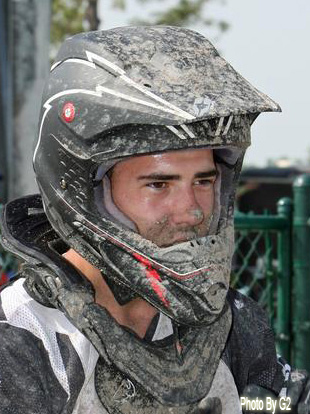 DZP: Give us the rundown on your day at Southwick. Joe: Well the normal day is Friday tech inspection and sound check at 3 p.m, but it ended up with me missing all of that and arriving at the track at 7 p.m. I was stuck in traffic in New York and Connecticut, so I walked up to tech inspection and they were closed and I had to ask the A.M.A if they even had room at that point and luckily they had some spots left after everyone was signed up. Saturday I was first practice. It was a brisk 50 degrees and raining so that didn’t make for the greatest of riding conditions, I just went out early in practice got away from a lot of the guys who ride around during the practice and just set a good lap time, and it seemed to stick after practice was all said and done I was 36th fastest which is great because I didn’t have to ride the LCQ. First moto was at 1 p.m so I go up and try and find a decent gate and I am way outside. Ended up with a bad start and crashed in the 3rd corner, got up went from 30th to 23rd in 2 laps then I high sided off an uphill and crashed and proceeded to DNF that moto ended up with 36th. 2nd moto was at 3p.m got another outside gate, got a better jump this moto and hit a bunch of down riders in the 1st turn. Got around them and passed a few guys and about a lap later I was in a outside line that came into the inside one and hit Christophe Pourcel, and ended up going down and getting stuck under the bike. I got up and realized my visor was broke so I rode to the mechanics area and had my friend push it way up so it didn’t bounce around, so at this point I was a lap down, and then I just decided to go out and finish the moto and try and salvage my day without another DNF. DZP: Who was your competition at Southwick? Joe: Myself really, just trying to stay calm and realize it was just another race. DZP: You have been racing a long time, how did you get involved in riding dirt bikes? 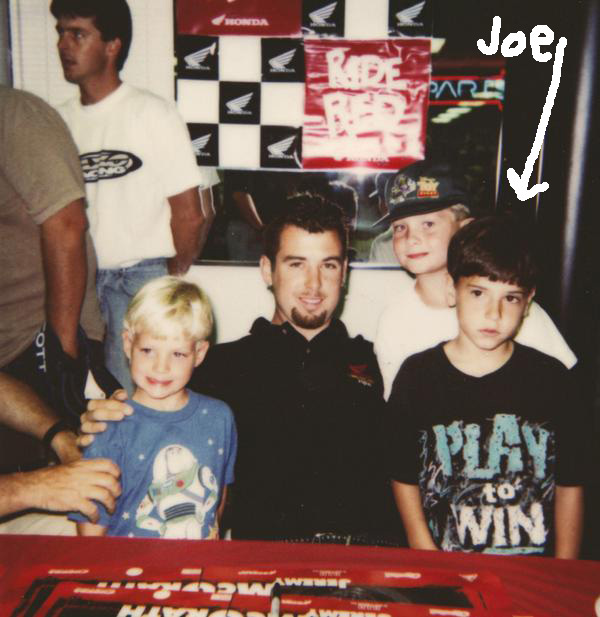 Joe: Well I’ve been racing since I was 9 years old and my passion for dirtbikes came when I was about 6, when I went to a few races with the Coutures and the Tampa Sx in 1996 that’s really how it all started. DZP: Explain a little bit about your training program. Joe: I have a really great program with Zach Ische at Fitness For Life, we work out 3 days a week and we work on a lot of cardio cycling, running,sprints and we also do strength training too those days are usually the worst he really pushes me. DZP: Who were you lined up next to at the gate for the first Moto? Joe: I was outside next to Hibbert and Picone. DZP: Who is your mechanic? Joe: Brook Thorpe, he does a hell of a job keeping my bikes together, if it wasn’t for him I am pretty sure my bikes would just be in pieces in my garage. DZP: Did you do anything special to your bike to prepare for this race? Joe: I ride a 2008 Honda CRF250 and 2007 Honda CRF 450. 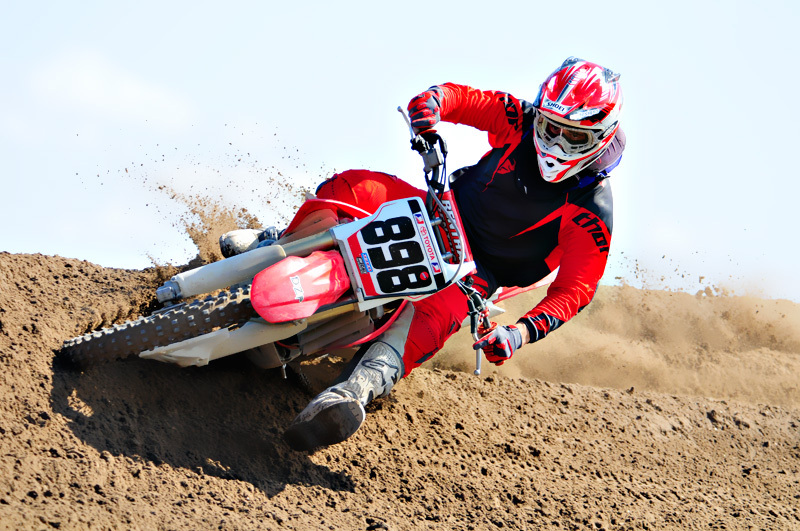 DZP: You have always been able to do well in the mud/sand, what tips do you have for other riders? Joe: I think the most important thing is to keep up your momentum and try and find the smoothest lines that take less energy and help you last the whole moto so you can finish strong. DZP: I like to ask this question. I would like to know what was going through your mind just before the gate dropped in the first moto? Joe: I am not going to lie, I was super nervous and I just wanted to get a decent start and ride to the best of my abilities. DZP: What are your plans for upcoming races, what is your schedule? DZP: What do you spend time doing when you are not racing or training? Joe: I am a pretty boring kid actually, I go to the movies and just hang out with my friends nothing to special. DZP: I think I know this, but, what is your favorite place to eat? DZP: Where can people keep tabs on you during your racing? Joe: My Mom and Dad are my biggest sponsors, AXO, Impulse Graphx, Fitness for Life, O.N.S Suspension, Active 8 Racing, and Pirelli. DZP: Who would you like to give special thanks to? Joe: My Mom and Dad, Brook Thorpe, and Zach Ische. Words can’t do much for how much I appreciate all the wonderful things they have done to help me in my life and in my racing. Thanks Joe, see you at the races!